Thanks to Jeri over at Smug Puppies, I have been dared to post pictures of my younger self here to Hot Chicks Dig Smart Men. 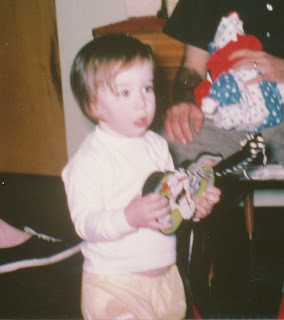 Here I am at my first birthday party, or Christmas, or something. The fact that my dad is in the background holding what appears to be my non-interesting gifts sort of implies I was getting the goods. 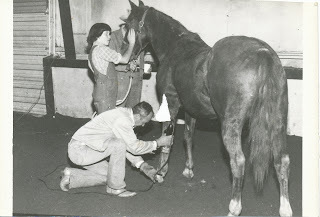 Here I am helping my dad clip horses at Westernaires, where I spent many, many years participating in horse-related activities. I think I was about 11 or 12? 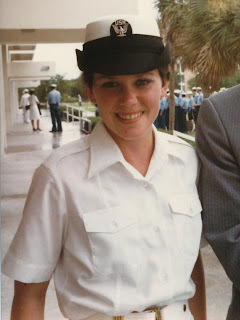 Here I am the day I graduated from Boot Camp. I was 18. I showed you mine...will you show me yours? Those are great! The commissioning picture is especially telling - you look very happy and proud. That's my pop to my left. I think he was prouder than me, former Marine that he was. I love the graduation picture. Karl - a couple of months *before* you were born? How does that work? My dad killed the grizzly a couple of months before I was born - had it mounted as a rug. Very cute photos, especially the graduation one. I'll only be able to post the one my brother posted a short while ago, as I have no current access to a scanner. I really hate to tell you this, but that's me with the Christmas gift. Really? It was in my Dad and Me album that Hot Mom gave us that one Christmas. No doubt. There were lots of pics of you in my album as well. Justt wanted to tell youu keep uup the famtastic job!